Warning! Leave dentures out at night. Part 2 – Fungal infections! In the mouth, not only live many types of bacteria, but also yeast and fungi. Generally the human, the bacteria, the yeast and the fungi live happily alongside each other. The human part of the equation also remains happy if the balance of yeast and fungus with bacteria is good. What this “good” balance is different for each person. This is only a problem if the balance tips more to one group than the other. Then irritations or even infections can occur. Wearing dentures over the gums (the proper term is mucosa) alters the local mixture of the micro-organisms. A microbial layer, or plaque, forms on the fitting surface of the denture (the surface which rests against mucosa, usually the palate), and on the mucosa which is covered. With continual wear of the denture and also lack of proper cleaning, this plaque may be colonized by the Candida species. This is a type of yeast. The local environment under a denture is more acidic and less exposed to the cleansing action of saliva. This favours high Candida enzymatic activity and may cause inflammation in the mucosa. Candida albicans is the most commonly isolated organism of this species in the mouth. 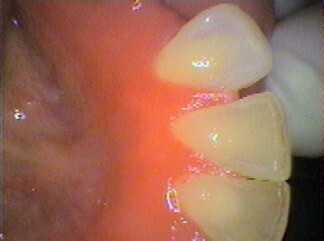 This leads to an inflamed mucosa under the denture. The area becomes more fluid filled as the body makes the blood vessels more leaking to enable white bloods cells and other immune response cells, to enter within the mucosa. The surface of the mouth on which the denture sits has changed. This can then lead to ulcers as the denture does not sit on the mucosa properly. THEREFORE IT IS IMPORTANT TO LEAVE DENTURES OUT AT NIGHT. ALSO THE DENTURES SURFACES NEED TO BE CLEANED TO REMOVE THE MICROBIAL PLAQUE. Regularly wiping the mucosa on which the denture sits, with a tooth brush, without any toothpaste, will reduce the microbial load. If the inflammation does not reduce after leaving the denture out at night, then anti-fungal medication may need to be prescribed by the dentist.